Happy National Healthcare Decisions Day! ﻿Who Needs an Advance Directive? Where can you find the form? This is a statutory form and can be found for free online. Click on the picture below to download a copy! After you print it out, complete it with your loved ones, sign it, and then have two witnesses sign it. No notary or attorney is required. What do you do with the form once completed? Completing a Georgia Advance Directive is an important step in planning ahead for future incapacity. It is never too early to talk to your loved ones about your (and their) healthcare wishes! 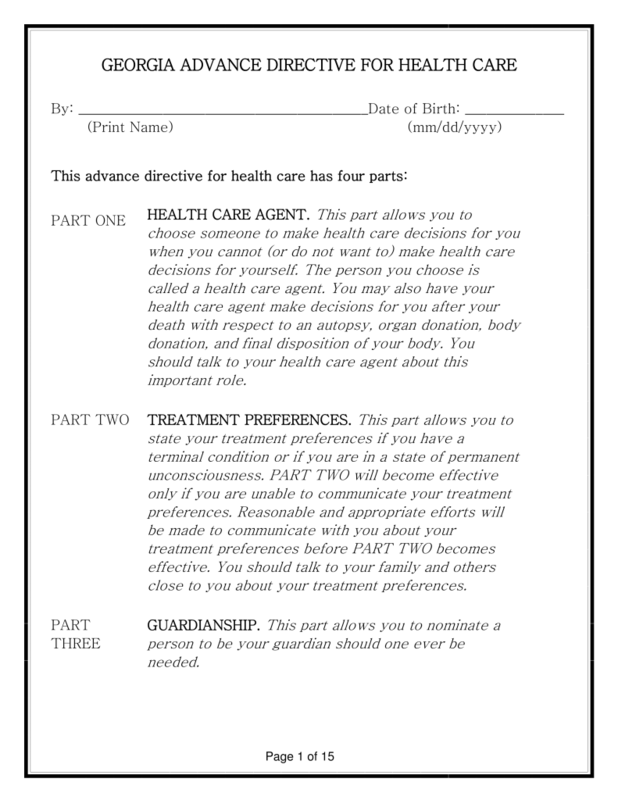 To learn more about advance care planning, please visit NHDD’s resource page. If our parents live long enough, they may likely need the care, oversight, and assistance of another person to meet their needs. Transportation, medication management, meal preparation, housekeeping, dressing, bathing, toileting, transferring, and feeding assistance—just a short list of tasks that more than 52% of today’s older adults will need help with at some point in their lives. You may be one of the thousands of adult children who are stuck, feeling lost and overwhelmed by this situation. In reality, many families just wait for a crisis that will force a major change or transition to a higher level of care. Our healthcare system is set up to respond to crisis situations. Every day an older adult enters the ER with a preventable issue—a fractured pelvis, shoulder or hip, a medication mistake, or a UTI and dehydration. This crisis springs the older adult into the acute care and then long term care systems. From the hospital to short term rehab in a nursing home to assisted living care, to memory care, or to in-home care, the older adult is finally getting the care he needs. For some families, things have to get worse to get better. Taking this approach works to some degree—the older adult is not confronted with the painful realities of their situations, the family members avoid uncomfortable conversations and tough decisions, and the older adult ends up in a higher level of care as a course of fate. Although it works, waiting for a crisis is unlikely to result in the best outcomes. When reacting to a medical emergency or a quick discharge from a hospital or nursing home, most adult children find themselves scrambling to set up the appropriate level of care. Additionally, the older adult may now be recovering from a preventable surgery or illness. When your parent or loved one needs more care, you may have to force the issue if they are not taking any steps or making any decisions. You may be one of the many adult children who have to make decisions for an aging parent. You may be in the position of having to initiate discussions on long term care needs, select long term care providers, handle all decisions and logistics, urge a loved one to accept more care, and convince others (like siblings or spouses) of your plans. No one wants to tell their parent that they need to move, that they can no longer care for themselves adequately, or that they have to do something they don’t want to do. When safety is a primary concern, though, hard decisions have to made. You may have to make a hard decision for your aging loved one. And you can expect that it will not feel great. Many adult children report feeling guilt, shame, grief, and resentment about having to interfere in their parents’ lives. Dealing with the realities of caring for an aging parent often brings up some strong emotions. Know that just because it feels awful, it isn’t wrong. You haven’t failed as a daughter, you’re not a failure of a son. Moving your loved one to assisted living or memory care doesn’t mean that you’ve failed to take care of them. It means you’re making a smart decision to get them the level of care they need. As a family member, your responsibility is to make sure your loved one gets the needed care but not necessarily to be the one to physically provide it yourself. There is hope. This will get better. Adjusting to living in an assisted living community, memory care unit, nursing home or with regular caregivers is a huge transition. Acknowledge that this is necessary but awful. See it for what it is and know that you have done everything that you can. Your heart may need time to heal and to catch up with what you know to be true and right in your head. At some point on this journey, you may need help. Moving to an assisted living community, memory care unit, or personal care home, hiring private duty caregivers, or even planning for the future can cause tension, stress, and friction in families. Geriatric social workers, aging life care specialists, and other trained professionals can help you and your family navigate the complex elder care world. Mindful Transitions is a team of clinical social workers that is dedicated to helping older adults and their families. We provide on-site mental health services, and we offer a Family Care Counseling package that includes 3 family sessions. This service is most helpful for families that have a hard time communicating about elder care needs. If you’re interested in learning more, please call visit our website or call our office at (678) 637-7166. It is uncomfortable for us to be around someone that has just experienced the death of a loved one. What do you say? Do you say anything about the death or the loss? Do you act like nothing happened? What if you make it worse? What if he starts crying? What if I start crying? Mindful Transitions’s last Mindful Minute (our monthly e-newsletter) offered tips for grieving the loss of a spouse. Our follow-up to that newsletter is a list of tips for supporting a grieving friend, co-worker or loved one. Acknowledge your discomfort and let it be—witnessing someone’s pain is hard. Be patient, empathetic, and understanding. Allow silence; listen without giving advice. Accept the tears, rages, and silences as normal and healthy. Acknowledge birthdays, death dates, anniversaries, etc. Accept that you cannot make them feel better. Avoid talking about the loss or death. Force the grieving person to talk about the death or loss. Try to fill the empty space with chatter. Let your sense of discomfort and helplessness keep you from reaching out. Talking to a friend, neighbor, co-worker or family member after a death can be uncomfortable and intimidating. Nothing is gained, though, by avoiding them or the topic. Remember, by reaching out and letting the person know you care and can be there through the discomfort along side them, you ARE doing something to help. You asked, "How am I doing?" If you've never known it you cannot fully understand. give me the pain...it was already there. And you don't need to do a thing but be there. You need not speak. Your silence as I cry is all I need. Listening with your heart to "how I am doing"
for when the tears can freely come and go, I feel lighter. for a touch of joy in my life. and sometimes you'll even find I'm laughing later. because I'm trying to protect you from my tears. then we can be close again. In our last newsletter, we discussed medication issues and the importance of medication reconciliation and regular medication reviews to make sure all of the right medications are being taken. Medication issues are no small matter for older adults. The financial and physical costs of taking too many medications can be quite high. 1. Verify your medication list, making sure you both know what you are taking. 2. Make sure you are only taking what is needed. 3. Evaluate if all medications are necessary and are worth any potential side effects. But what if your primary care doctor says that she cannot oversee or manage your psychiatric medications? What should an older adult do to get good advice on their medications? A geriatric psychiatrist is a doctor with special training in the diagnosis and treatment of mental disorders in older adults (e.g., depression, anxiety, substance use disorders, dementia, etc.). 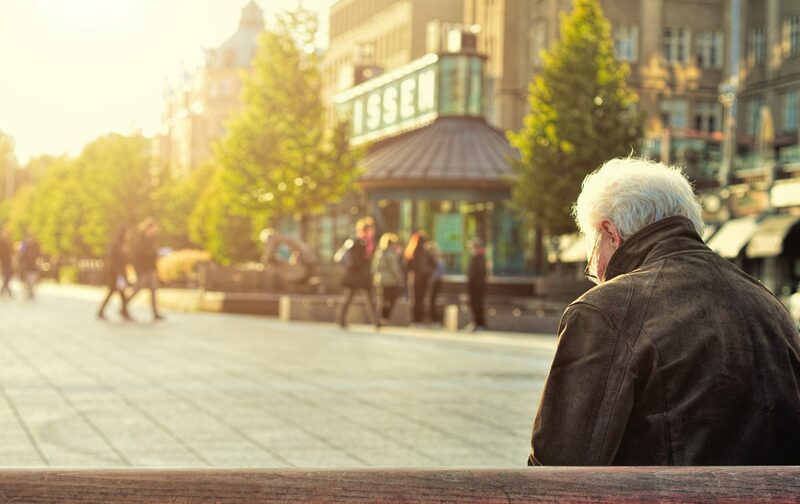 A geriatric psychiatrist may be preferred over a psychiatrist that specializes in adults because older adults have special physical, emotional, and social needs that impact their mental health treatment plans. Keeping this in mind, geriatric psychiatrists take a comprehensive approach that addresses co-existing medical illness and medications, family issues, social concerns and environment issues. Establishing a relationship with a geriatric psychiatrist is usually recommended for our older adults dealing with mental health issues. We value their knowledge and approach and have witnessed the significant changes that usually follow their interventions. Atlanta, like most communities, has a shortage of geriatric psychiatrists. We are lucky than most communities, but it can still be frustrating to find a geriatric psychiatrist and to get a timely appointment. You can begin the process by asking your primary care physician for a referral. If she does not have a geriatric psychiatrist referral for you, please contact our office at (678) 637-7166 or inquiry@mindfultransitions.com. We would be happy to help you navigate this issue. For questions about Mindful Transitions or to learn more about our team of Clinical Social Workers, please visit our FAQ page, call us at (678) 637-7166, or email us at inquiry@mindfultransitions.com . By Far the Best Christmas Gift Received by Our Clients! We were pleasantly surprised to see that a number of our clients received an Apple Watch for Christmas! 2018’s Apple Watch came with features that made it the perfect gift for some of our clients. In case you missed it, Apple announced in September that they were adding a fall detection feature to its wearable technology, making it a no-brainer for many older adults. Because falls are a real risk for many older adults, many could benefit from wearing a medical alert device, but many do not wear them because they are bulky, ugly, and stigmatizing. As a result, many who would benefit from wearing one, do not. Enter the world of smartwatches to help older adults and their family members who worry about falls to find some peace of mind without having to use one of those “ugly” pendant buttons. Fall Detection: The watch will monitor for hard falls and then ask the wearer to check in. If the wearer doesn’t respond, 911 is called. Electrical Heart Sensor: Provides ongoing monitoring of the wearer’s heart rate and will send notification when there is a low or fast heart rate. Wrist Calling: The wearer can make or receive calls from his/her wrist. The watch can be connected to the wearer’s iPhone and to WiFi to make calls without holding the phone. The wearer can even use Siri to make calls and never have to push a button. Easy Emergency Calling: There is a button on the side of the Apple Watch that just has to be pressed to call 911. Reminders/Alarms: The watch can be programmed to give regular reminders to take medications, get some physical activity, check in with a loved one, etc. Location Capability: Others can find the wearer (if authorized) through GPS tracking, providing reassurance to those that worry about their loved ones potentially wandering. Larger Screen and Louder Speaker: This latest version of the Apple Watch has a screen that is 30% larger and 50% louder. Hard to Lose: Since the watch is attached to the wearer’s body, it is hard to lose. Many older people don’t want to wear medical alert buttons because of the stigma associated with them, but they could benefit from their use nonetheless. The latest Apple Watch will help them to get this benefit while wearing something that looks more appealing and offers additional functioning. We are so excited for our clients that have new Apple Watches. Do you know any older adults that have recently started wearing Apple Watches? What have you heard? Please share your thoughts and experiences by leaving a comment on our Facebook Page. The majority of our clients have a concerned family member either living with them or living nearby to help with emergencies, errands, doctor appointments or even day-to-day care. Caregiving is a tough job, and every caregiver deserves a break. If you are caring for an aging or disabled loved one, you know how easy it can be to become overwhelmed, tired, and burnt out. We encourage all of our family caregivers to take some time off from caregiving to recharge and rest, but we also know that it can be so hard to get away even for a long weekend. Just in time for the holiday travel season, we wanted to share some information about caregiving and vacationing. As a caregiver you have so much responsibility on your shoulders. You have your own health, your own household, maybe even a job or business and a family of your own to be concerned about. On top of this, you have an aging or disabled loved one that depends on you so much. Sometimes getting through the day takes more energy and time than you have; so doing that AND planning a vacation seems impossible! Vacations do not have to be exotic, far away or fancy. “Staycations” where you simply stay home, unplug, order in food, and watch movies all day can be rejuvenating and restoring. Staying at a bed and breakfast a few miles away can give you the break you need. And if you truly want to get away, let a travel planner, your credit card company, or even Costco make your arrangements—so many businesses now offer travel booking as a special perk. You may not get the vacation of your dreams, but you will get some time away to get a break. It doesn’t have to be a perfect vacation in order to give you the break you deserve. Many caregivers feel like they need to put their life on hold while they are caregiving. Even though they may have grandchildren they rarely get to see or dreams of their own yet fulfilled, they resist giving themselves permission to travel out of state to see other family members or to see the parts of the world they long to experience. Caregivers deserve a life, too, and looking after yourself is not selfish or self-centered. Taking care of yourself, investing time in what you want and need may not be appreciated or approved of by others, but you do not need their permission to live your life. You can spend time on yourself and meet your caregiving responsibilities. “There’s no way I can go out of town. Everything seems to fall apart as soon as I leave.” This is a common reality for many caregivers. After MONTHS of stability and calmness, a caregiver may feel like it’s an okay time to travel or leave town for just one week. Without fail, it seems as if that’s when the emergency happens! Mom ends up in the hospital, constant calls start coming in with high anxieties, a fall occurs, the list of possible emergencies never ends. Or what if the worst happens—what if your loved one dies while you are away? Could you ever forgive yourself? The fear of emergencies happening while you are away is real. You can make contingency plans for this. Assign someone else to be the primary contact. Is there another family member that can be the emergency contact? You can hire an Aging Life Care Manager to be the main contact while you’re away if there is no family. You could also decide to provide care remotely, traveling only to places that allow you to be accessible. You can hire a certified nursing assistant to provide companionship for your loved one while you’re away or consider a respite stay at an assisted living community. You may have options to help your loved one while you’re away. It will be hard work to get the plans in place, but it will likely be well worth it so that you can get a break. And although you can make great contingency plans, there is the chance that you will not have everything planned out perfectly. An emergency may occur, your loved one’s anxiety may be higher, or the worst may occur. Making the decision to not vacation or travel because of this is making a fear-based decision. Being a caregiver can often put some of your wants and needs in conflict—you may find yourself wanting to be a good caregiver to someone you love and also needing to have a break from caregiving or just time away to do something else. It’s not easy to prioritize your own needs, but taking time for yourself is not selfish or self-centered. You will likely be a better caregiver once you get a break. This holiday season, we wanted to share this encouragement with all the caregivers out there. Caregiving is hard. We know what you are doing day in and day out, and we believe that you deserve a break, too. For our clients, we work closely with the individuals and their families to help make the times the caregivers are away to be calm and stress-free. Whenever possible, the therapists at Mindful Transitions try to meet with our clients during the caregiver’s absence, and we provide our clients with extra tools to handle their stress and anxiety during those times. We also often act as extra ears, eyes, and hands for the caregivers, relaying back important information while they are away. We learned earlier this year that suicide rates have risen drastically since 1999. In that time period, suicide rates increased 25% in the US. Shockingly, there were more than twice as many suicides as homicides in 2016. Currently, suicide is the tenth cause of death in the US. This is discouraging news, to say the least. From the explanation of the data, it is almost impossible to predict (and therefore prevent) if a person will attempt suicide. Providing timely, effective interventions is what every mental health clinician and emergency resource strives for, but this seems not to be enough. One study found that over 75% of those who die by suicide , denied having any suicidal thoughts or intentions in their last communications. There are a variety of opinions and ongoing clinical research about what could help prevent future suicides. Clinicians have studied/are studying the ideas of changing public policy to reduce the availability of guns, reducing access to dangerous medications, and even erecting fences around certain areas. * Let us not be afraid to demand larger, community-wide, government-backed ways to prevent suicide. The work clinicians, friends, family members, church families, and others do to prevent suicide matters, but we need more. We will continue to do what we do. The clinical social workers at Mindful Transitions are trained in suicide assessments and preventative strategies with our clients. We continue to help our clients build resiliency, to cope with stressors, and to create functioning social networks. We share our training with other elder care professionals, and we advocate for changes at the state and local levels. *Miller M, Lippmann SJ, Azrael D, Hemenway D. Household firearm ownership and rates of suicide across the 50 United States. J Trauma. 2007 Apr; 62(4):1029-34; discussion 1034-5. *Klieve H, Barnes M, De Leo D. Controlling firearms use in Australia: has the 1996 gun law reform produced the decrease in rates of suicide with this method?. Soc Psychiatry Psychiatr Epidemiol, 2009; 44: 285-292.